James | NW Pressurewash - Central Oregon Pressure Washing Services in Bend Or. A snowy town is nice to look at, especially during the holidays, but can cause problems when not properly dealt with. Even when the snow is shoveled or plowed after a major snowfall, there always seems to be some remaining that is just impossible to remove by shoveling or plowing. To make matters worse, the repetition of melting and freezing with the rise and fall of the winter temperatures can cause a difficult to remove buildup of ice and packed snow. There are many problems that can arise from having excessive ice and snow buildup on your commercial or residential property. 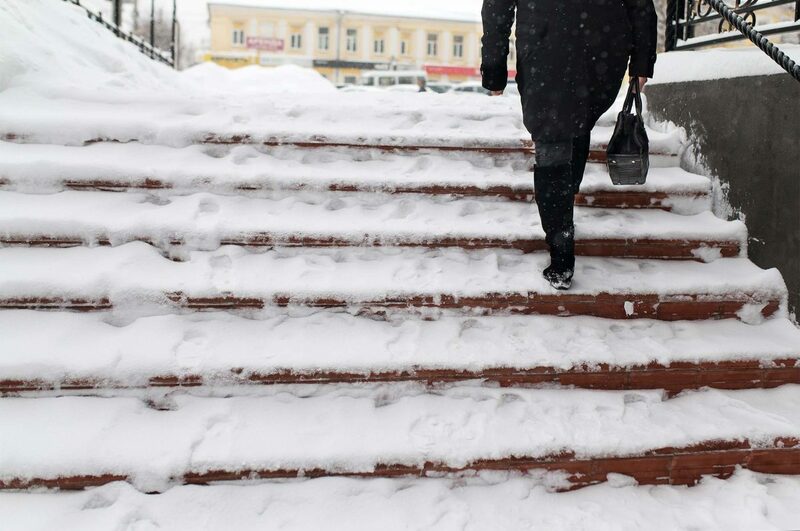 The first and most obvious problem is the safety concerns that arise from the slip and fall hazard of having to traverse across icy pavement. Another less thought concern is the drainage issues that snow and ice buildup can cause. The buildup of ice and snow berms created by plows can block the natural drainage of water from parking lots, sidewalks and driveways. Blocked drainage can cause the flooding and then re-freezing further worsening the problem. If the flooding is near doorways or other ground level openings, the flooding can enter the building as well causing water damage. Freezing water can also cause damage to concrete and asphalt if it is allowed to puddle over cracks in the surface and then freeze. The frozen water then expands breaking apart the concrete or asphalt causing the crack to worsen exponentially. The best solution to these problems is to remove the ice and snow completely and, the best way to do this is by pressure washing with very hot water. The hot water melts the ice and snow away with ease and allows the water to drain away naturally. There is no worry of damage to the pavement or other substrate either as from removal by trying to chip away the ice with metal tools of some kind. If you have problems with snow and ice buildup, <a href=”/quote-book”>request a free quote</a> from Northwest Pressurewash today. The best solution to these problems is to remove the ice and snow completely and, the best way to do this is by pressure washing with very hot water. The hot water melts the ice and snow away with ease and allows the water to drain away naturally. There is no worry of damage to the pavement or other substrate either as from removal by trying to chip away the ice with metal tools of some kind. If you have problems with snow and ice buildup, request a free quote from Northwest Pressurewash today. James Yos is the owner of Northwest Pressurewash and has over 10 years experience in multiple aspects of the pressure washing industry.